Sharp and the Essential Phone, which essentially pioneered the top bezel protrusion we started calling a notch since Apple introduced a giant one in the iPhone X, went about it in a subtle way. Their top thingies only house the selfie camera and are very minimalistic. Apple, however, opened the copycat floodgates and companies like Huawei or LG went to town on their top bezels to achieve the same "all-screen" effect, while others like Samsung or Sony, stuck to their guns. Still, phone makers are trying to solve the notch-or-not conundrum in pretty inventive ways these days, starting with intriguing pop-up or slide-out camera design, and culminating with the "all-screen" slider Mi Mix 3 that was just announced yesterday. What's a manufacturer that doesn't want to go the slider way to do, though? Even the smallest, "dewdrop" notch, however, still connects with the top bezel, and sliders have their own set of reliability, waterproofing, and case-wrapping issues, so a new paradigm is now forming. Samsung, Huawei and Apple have all now patented approaches that may do away with the whole bezel peninsula or slider concepts, and take the drill bit to the display directly. Brace yourselves, the screen piercings are coming! 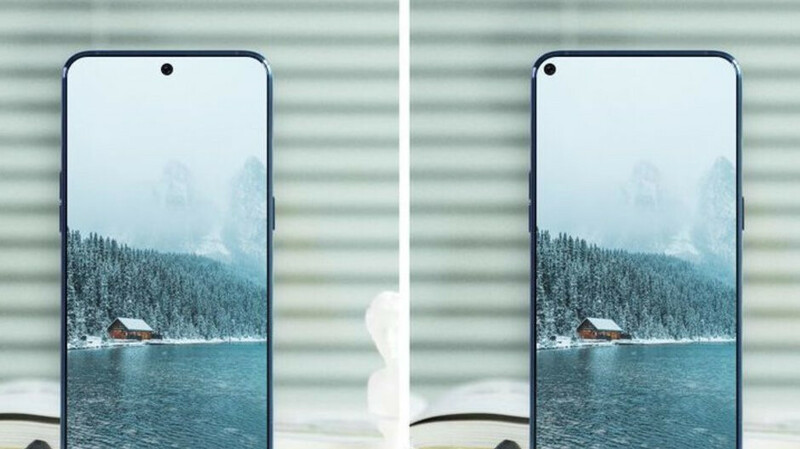 Yes, there is now even a phone nearing release that is rumored to pioneer the hole-in-display concept for fitting the tiny front camera sensor there, thinning the top bezel to the extreme in the process. That handset is the eventual Galaxy A8s that Samsung teased at the end of an event recently. It is supposed to have the selfie cam in the display itself and may be a harbinger of things to come with the Galaxy S10, as Samsung recently started introducing flagship features in its midrangers to gauge acceptance and increase their appeal. 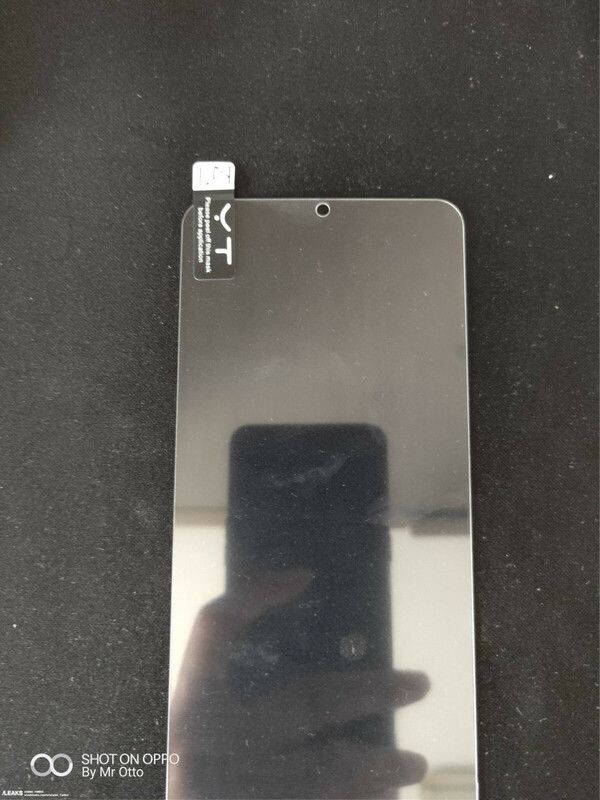 Today, an alleged screen protector leak for the Galaxy A8s has surfaced, and it sort of confirms the hole-in-the-screen speculation. As you can see, it has a small opening in the top middle, where the eventual front camera is slated to be, which isn't continuing towards the top, meaning that there could still be display area on top of it. We can't wait to see how this design will be applied in practice, and what screen-to-body ratios it will be able to achieve in the never-ending quest towards an "all-screen," "bezel-less," or whatever you name it, phone. You have yourselves expressed a preference for such a design, as well as for sliders, which might mean that the good ol' notch's days may be numbered. You can add virtual notch in this phone if you want..
How? So a bigger hole is the screen, that blocks more screen real estate looks better? Ok! Let's apply what you're saying to all screens. So you think Apple notch would look better on a movie screen? Computer display? Car windshield? How about if such blocked your vision from both eyes? I mean really dude? Well you're an Spple fan do. It explains alot. Samsung is trying to minimize the obstruction. Smart move! 2019 is shaping up to be an exciting year in phone tech. Now I just need to determine if I hold out for a 2019 phone, or purchase the OnePlus 6T next week. Definitely pick up the 6T I know I am, will be my first one plus device... I've held out for this one... I can't pass up that in screen fp scanner. It will get me ready for Samsungs in display scanner. So I say that to say... Get both! It would be my first OnePlus device as well. The front in-display fps is what I've been wanting for a while. I won't buy a phone if the fps is on the back or side. However, the lack of headphone jack is making me hesitate though. I've been messing around with a Moto G6 for the past few weeks and while it's a decent phone with some nice features (shake twice to turn on the light, twist to turn on camera), I miss my S Pen and Samsung Pay that my Note 5 had. Ughh I'm torn. First world problems yo. The issue I have with Face ID is the annoying swipe to get to the home screen once it unlocks (again...first world problems). The OnePlus 6's face unlock is extremely quick and doesn't require an extra swipe, but it's obviously not as secure as Face ID. The 6T's face unlock along with the in-screen fps will be the best of both worlds on one device. I agree with face ID but now it's just muscle memory at this point... I'm ready for the in display onslaught! Notch defect or hole defect, same to me ... broken screen. "Shot on Oppo by Mr. Otto". Water Drop Notch is much better than this dead pixel hole. Water Drop Notch is uglier than most other notches. This looks way better than the notch in my opinion. Yeah it should be called "all-scren" design with chin!!! This is about the most tolerable option for eating into screen real estate, but only the upper corner approach. Looks good, plus Kudos to Samsung for innovating something exciting and staying away from Notch trend. I do like this better than anything I’ve seen so far, but not sure how that’s going to work as the screen requires complete string for pixels to work, putting a hole seems to cut that string mid point. Which I’m sure can be figured out by giants like Samsung. Furthermore very excited about this as my next purchase will be a note 10. If this comes to fruitition today - I sure expect this on Samsung flagships coming next year. Just a thought, but would the first phone with a notch technically be the V10? I've thought about this a lot. And when you think about it, the camera to the left were technically a notch with the dual screen to the right. I actually really liked that phone. It's one of my favorites I've had. I wonder why no company has thought about making a notch to the left side or right side again? I'd prefer that to the centered. Never bought a phone with a notch and will never buy a phone with a hole. Never support crap design. I'll leave you guys to enjoy your B tier devices at top dollar prices. get rid of the chin first, then we can talk about notch or hole. if it still has a chin, it's pointless, just put the camera on the chin no need for notch or hole.